One of the toughest dilemmas with online learning is getting the attention you want as a student. In a traditional classroom, you can raise a hand to ask a question. That’s not so easy with the increasingly popular massively open online courses (MOOCs). Still, these MOOCs have really taken off, because they scale almost infinitely and cost a lot less than a traditional university course. Unfortunately, the students are forced to suffer outrageous student-to-teacher ratios. All of that is what TutorMe hopes to help with. How Does TutorMe Differ From Other Tutoring Services? TutorMe is an instant online tutoring service. It currently has 5,000 tutors available, covering more than 300 various subjects. These tutors aren’t just your average, run-of-the-mill educators, either. TutorMe claims that its acceptance rate for tutor applicants is around four percent, ensuring the company’s students get a high-quality tutor all the time. Attracting these high-quality tutors costs money. TutorMe isn’t the most expensive tutoring service I’ve seen, but it is costly. If you choose the pay-as-you-go model, you’ll pay one US dollar for every minute of tutoring. Or, you can choose from various packages, ranging from $39 per month for an hour of tutoring each month up to $119 monthly for four hours. This is 24/7 on-demand help with the highest-quality tutors, covering more than 300 subjects. One of the biggest benefits to TutorMe is that you don’t have to wait forever to be matched with a tutor. The average time to connect with a tutor is 18 seconds, making TutorMe virtually the only website that will connect a student with someone to help in less than a minute. How Did TutorMe Come to Be? At the University of Southern California (USC), Ari Stiegler and Myles Hunter realized the tutoring center closed at 6 p.m. Unfortunately, since Stiegler, Hunter, and all of their friends worked after class and needed help at 10 p.m. or later when they were cramming for a test. Using money the two had made working for Lyft, they constructed the basic version of TutorMe. The basic version was successful enough that the service expanded, and the crew behind TutorMe developed the first fully animated ACT course as a giveaway product to draw even more attention to the tutoring service. In September 2016, TutorMe reached out to colleges, and is providing online tutoring services to dozens of them around the world. Those colleges account for around 120,000 of the more than 180,000 students TutorMe helps each year. TutorMe has built a state-of-the-art 1-on-1 lesson space into the MOOC model. This gives students access to professors, teaching assistants, or tutors. The service bridges that last gap between what an in-person class can achieve and what an MOOC can. It’s truly revolutionary, and it works remarkably well – for an online tutoring service. When a student signs on to TutorMe, they explain what they need help with. 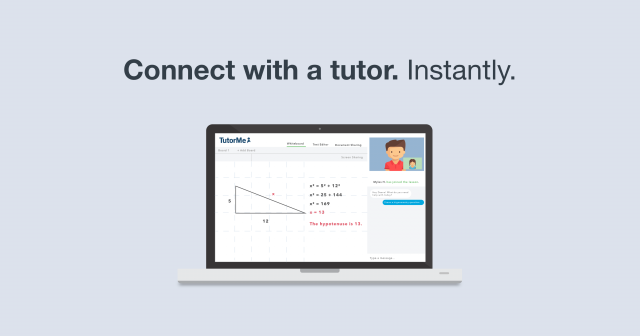 The site’s smart matching system then connects the student with a tutor, providing 1-on-1 help in TutorMe’s lesson space. That space includes a virtual whiteboard, audio/video chat, a text editor, and more. After the session is complete, the student and tutor have the opportunity to rate each other, helping ensure the community maintains a high level of quality. What Are the Drawbacks of TutorMe? When I tried out TutorMe, I was really only bothered by one thing. I wasn’t physically in front of that tutor. Even though I could see and hear him, talk to him through the audio/video chat, I couldn’t easily write down notes for him to review. Everything had to be done in the confines of the online lesson space. With that said, the tools TutorMe provided minimized how much that really bothered me. The only real drawback to TutorMe, from my perspective, is cost. I understand, though, that attracting high quality tutors costs more than pulling in the average 3.0-GPA college kid off the street. These tutors are smart, and good at teaching their subjects. I guess my point is that there really aren’t drawbacks, per se, to TutorMe. Just issues to be aware of. Where Is TutorMe Going From Here? The concern about being physically present with the tutor is something that TutorMe is aware of and hopes to change. The company is currently testing a Virtual Reality (VR) technology that would integrate directly into a school’s Learning Management System (LMS). I would presume that this VR technology would also be available within TutorMe’s 1-on-1 lesson space. The moral of the story is this. TutorMe is a great service, once you get over the fact that you aren’t meeting with your tutor in person. Then again, if you are a MOOC student (TutorMe’s target audience), you’ve already given up the idea of a traditional, physical presence with your educator. With TutorMe, you get the high quality 1-on–1 tutoring you need, at a price you can afford.